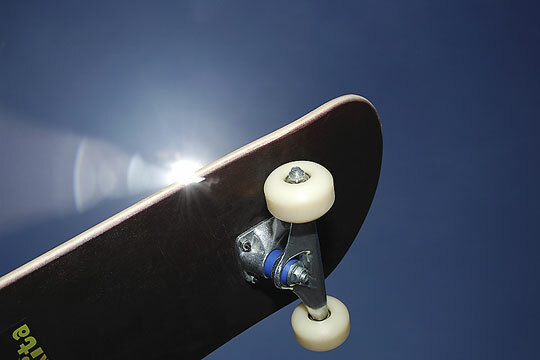 Skateboards include several basic, universal components: the board, the trucks and the wheels. Each can be replaced and modified to fully customize your board to your own specifications. In fact, many skateboards today are built in this manner, although those new to the sport will still find pre-built skateboards available. The board itself is often a plywood mixture, built to withstand the punishment of jumping and impacts. Many also have plastic or metal rail guards which reduce the damage the board suffers when grinding. The top of the board has an abrasive design to help the rider keep his footing and increase his traction when trying spinning or jumping tricks. Trucks and wheels complete the underside of the board. The trucks include the axle and the board mounting. The mounting contains at least one layer of rubber, the purpose of which is to facilitate turning the board. The axle mounts the wheels in place, and is also built to limit the effects of constant grinding. With all the tricks skateboarders perform, the threat of injury is nearly constant. Safety gear for skateboarding includes a wide array of pads and a helmet. Elbow and knee pads are also common. Falling from a skateboard is often face first, so wrist guards are also common to prevent damage to the palms or breaks at the wrist. Find a broad selection of skateboards, decks, trucks, wheels and bearings plus skateboard shoes and clothing. This online skateboard shop features an extensive selection of skateboards, skateboard parts, and skateboarding equipment. Search by product, brand or keyword. The IASC strives to represent the global skateboarding community by listening, understanding and acting on the needs of skateboarders and the skateboard industry.